A 4¼ mile walk from Tower Hill tube station (District & Circle lines) or Tower Gateway (DLR) Station through St Katherine's Dock, Shadwell and Wapping finishing at Shadwell Station (Overground or DLR). Wapping Station (Overground) is on the route. Before starting out you may like to look at the large raised sundial opposite which illustrates the history of London. Can you spot Maggie Thatcher? Take the subway from the station entrance towards the Tower of London. This is lined with murals and goes past some remnants of London Wall. The former Mint buildings (in use 1810-1975) are to the left. Go through a gateway (with elephants on the piers) to the right into St Katherines. A hospital was established here in 1147 by Matilda, wife of King Stephen, which survived the Reformation. However it was demolished, along with over 1000 houses, for the construction of the dock complex, designed by Thomas Telford and opened in 1828 to handle cargoes of value. The dock closed in 1968 and was subsequently redeveloped. 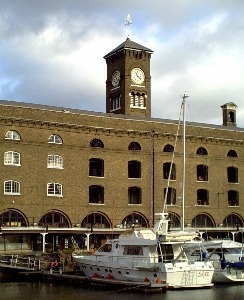 Ivory House, featuring a clock tower and dockside colonnades, was built in 1858-60. This was constructed in 1977 for the Queen's Silver Jubilee. Continue around the Western Dock towards the hotel and riverside. Some historic craft are moored here including Thames barges. Cross by the footway over the dock entrance to the Dockmaster's House (1828). Ships can only enter for 3½ hours on each high tide. Go across to the Dickens Inn. This was built around the remains of a timber-framed warehouse building and was moved 180' to its present site. From Marble Quay go along St Katherines Way. The Hermitage Basin was constructed by John Rennie in 1811-21. Gate piers, an impounding station of 1913-4 and a hydraulic pumping station of 1856 remain. Opposite is a riverside park. Go along Thomas More Street. The wall along this street would have surrounded the London Docks complex. At the corner with East Smithfield are former dock offices for Customs & Excise designed by D A Alexander in 1805 which until 1840 were positioned outside the walls. Right at East Smithfield, cross at the lights and go along Dock Street. Wilton's Music Hall opened in 1858 on the site of a pub which had included a concert room. It closed in 1880 to became a Wesleyan Mission Hall (1888 - 1956) then a rag warehouse (until 1966). It was the winner of the London heat of the first 'Restoration' TV programme and is often used for filming. It retains carved plaster balconies on twisted cast iron columns and a stage at an apsidal end. This was laid out by Nicholas Barbon in 1682-3 with the houses occupied by sea captains and wealthy merchants. There was a Danish Church in the middle which was demolished in 1869 for St Paul's School. A court house and prison, whose cells are now displayed in the Museum of London, was built in 1700 on the south side. The houses declined and although they survived the Blitz were demolished as slums in the 1960s. Go around clockwise to the SE and continue through the park. Exit onto The Highway and go left. Left into Cannon Street Road. St George's in the East was built in 1714-29 under the '50 New Churches Act' by Nicholas Hawksmoor. It was burned out in WWII and remained as a roofless ruin until 1963 when a new smaller church and some flats were built within it. Go through to the churchyard. Tobacco Dock to the right was built by Daniel Alexander in 1811-4 to store tobacco plus wines & spirits and later furs & skins. It was made into an attractive shopping village at a cost of £30m by Terry Farrell in 1984-9 but did not succeed. It has now been re-launched as an events venue. Two replica ships are moored on the quayside. The Three Sisters is a copy of a 330 ton ship built at Blackwall Yard in 1788. It took manufactured goods to the East & West Indes and returned with tobacco & spices. The Sea Lark is a copy of an 18th century American built schooner. It was captured by the Admiralty during the Anglo-Amercian War in 1812-4. Detour left into Raine Street. The former charity school building of 1719 is now used by the Academy of St-Martin-in-the-Fields. St Peter's Church which has a polychromic interior was begun in 1865 but not completed until 1939. It was restored after WWII bomb damage. Go across the green to Turner's Old Star pub and along Watts Street. The pub has a plaque which details its connection with the artist. There is a former fire station to the left. Go through the park to the left to St Patrick's RC Church (1879) then right along Green Bank. The former Turk's Head pub on the corner is now a cafe. On the wall is an old street sign 'Bird Street 1706'. Only the tower and shell of St John's Church (1756) survived wartime bombing. It has now been converted into housing. The churchyard became a public park in 1951. The former charity school building with Coade Stone figures (built 1756-60) and its later southern extension are also now housing. Detour right to view Oliver's Wharf (converted 1994-5), the Town of Ramsgate pub and Wapping Old Stairs. The Town of Ramsgate, originally the Red Cow, was re-named after the Kentish fishermen who landed their catches nearby. This was also the site of Execution Dock where pirates were hanged. In 1688 Judge Jeffries was captured in its cellar. Wapping Pier Head was the main entrance (now infilled as a garden) to the London Docks from the river. The terraces of houses for dock officials were designed by D A Alexander in 1811-3. Return and continue along Wapping High Street eastwards. The cream box building (1973) is the boat repair yard for the river police who have a police station (built 1907-10) at number 98. These are separated by Waterside Gardens and Wapping New Stairs. The workshops of St John's Wharf have been converted to the Captain Kidd pub. This is at the northern end of the world's first underwater tunnel built by Marc & IK Brunel in 1823-43. Originally open only to pedestrians it was taken over by the underground railway in 1869. If you have a valid travel ticket it is worth going down the stairs, which use the original shaft, to the platform for a view of the tunnel. Beyond the station follow the signposted Thames path along the riverside, emerging at New Crane Wharf. Continue along Wapping Wall past Metropolitan Wharf. The Prospect of Whitby was originally called the Devil's Tavern and has associations with Pepys. It was re-named after a collier ship when it was rebuilt after a fire. This would bring coal for the hydraulic pumping station opposite, built in 1889-93 and closed in 1977. It is now a gallery/restaurant. Cross the bascule bridge, go down the steps and walk anti-clockwise around the basin. This provided an eastern entrance to the London Docks. The old basin (south) was constructed in 1828-32 and the new basin (north) added in 1854-8. This is now used for watersports and fishing. Go up the steps to St Paul's Church. This was one of the 'Waterloo' churches designed in 1821 by John Walters. It replaced a chapel of ease of 1656, rebuilt in 1669. It has associations with the explorer James Cook. Go right along the Highway. Gordon House flats replaced the Meredith & Drew biscuit factory. Enter King Edward Memorial Park at Glamis Road and walk along the path running below the terrace. The park covers the site of a market and waterworks established by Thomas Neale by 1681. Victorian slums and a short-lived fish market were demolished for the park, opened in 1922. To the right is the air shaft for the Rotherhithe road tunnel. At the end of the terrace bear left out of the park and cross the lights into Brodlove Lane. There is a Peabody estate to the left. At the end go left along Cable Street. A terrace of old houses remain on the left. On the right is the Ship pub and St Mary's Church. Further along Gosling House was built on the site of ropeworks. The corner had to be repaired after bomb damage. Slum housing was cleared for the construction of Ring House. The fire station replaces an earlier building in Glamis Road. Shadwell Overground station is on Cable Street. The DLR station is to the right just before this.